For instance, “Spring,” shows the face of a woman smiling. Her skin, hair, and clothes, however, are composed of the petals and stalks of spring flowers. 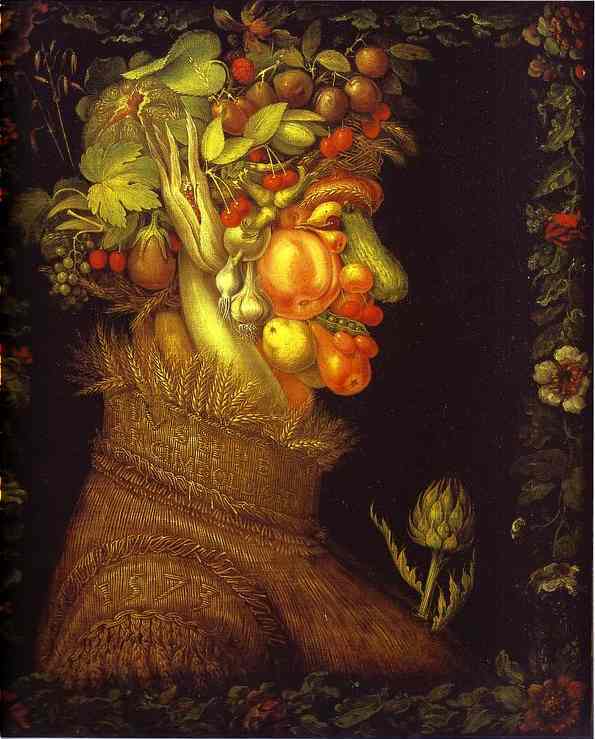 “Summer,” presents a face constructed out of different kinds of summer fruit and vegetables. For practitioners of aesthetic appreciation, we must work hard to get past the extraordinary illustrative appeal of these pictures. We must work hard to get past Archimboldo’s superb technical skill, his ability to render minute and exact detail, to fool us into believing we are seeing real peaches, apples, fish, flowers, etc. 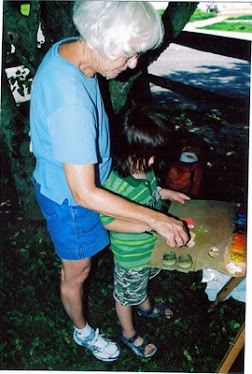 and not oil paint on wood or canvas. We must work hard to get past the cleverness of the visual puns: in the “Vegetable Gardener,” we see a dark green bowl filled with various root vegetables. 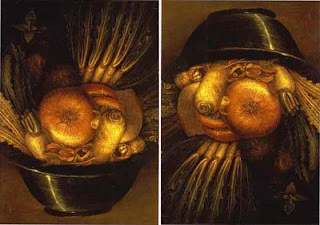 Upside down (assisted by mirror-topped pedestals) the bowl full of vegetables turns into a chubby-faced head. 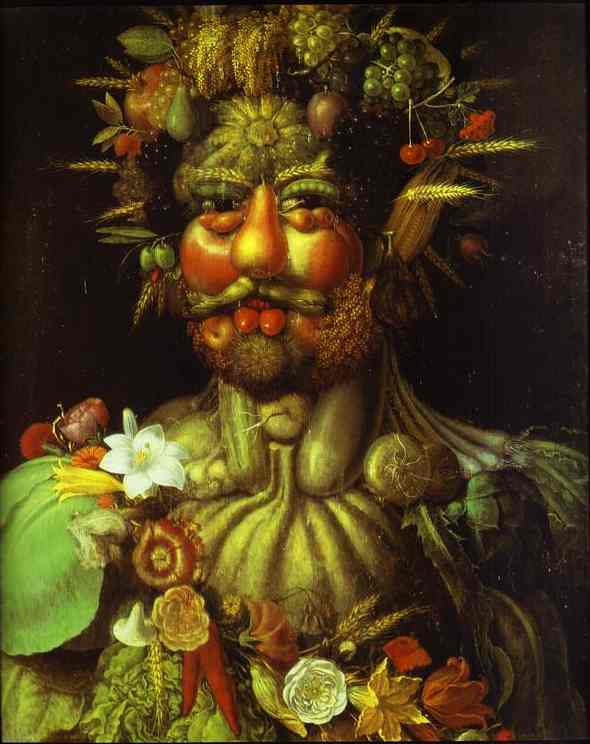 I laughed aloud in front of “Vertumnus,” Archimboldo’s portrait of Rudolph II, rendered in fruits, flowers, and vegetables representing the four seasons. A woman next to me felt the need to correct my mirth: “That’s not meant to be funny,” she told me with great authority, “it is about imperial dominion over all the world’s bounty.” I chose not to argue with her. If we want to understand the aesthetic meaning in this work, we must look for and perceive the qualities of things rather than the things themselves. The “joke” in these pictures is that faces are made out of fruit, flowers, or fish. No matter what the subject was, no matter how the artist manipulated things we recognize, we still must confront the picture. We must read the color. Archimboldo does transfer some qualities into his pictures, but these qualities are, for the most part, transferred from the Florentine tradition (the clean-cut spatial intervals, the labeling color, modeling achieved by light and shadow). The outstanding feature of his work is bizarre arrangement of subject facts. Much later, surrealists jumped on this idea. However, Archimboldo did not “invent” it. This 15th century Italian painting in the John G. Johnson Collection at the Philadelphia Museum of Art was originally part of an altarpiece depicting Saint Nicholas of Tolentino and his miracles commissioned for a church in Montepulciano in Southern Tuscany. Giovanni de Paolo may have had access to first-hand accounts of the miracles because the government of his hometown of Siena owned a copy of the testimony of witnesses to the event. 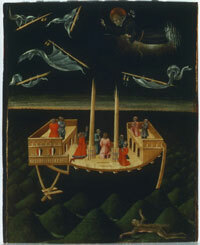 However, he added the naked figure swimming in the foreground enticing the sailors to steer off course, he levitated the ship and the Saint’s head, swept the flying sails forward and back in the black space, and rounded the roiling waves into receding mountaintops. 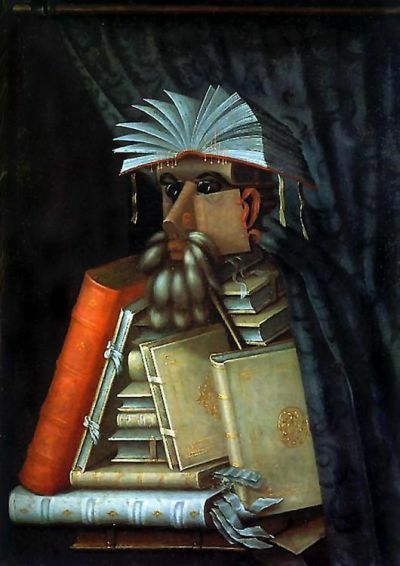 When I first looked at this picture, I said to myself, “this artist was a surrealist.” Sure enough, I discovered this picture was included in a group of “forerunners” in the exhibition titled Fantastic Art, Dada, Surrealism held at MoMA in 1936. Nevertheless, whether Archimboldo is the “grandfather” of surrealism, or the first painter of still life subjects, or his work investigates naturalism, the grotesque, or imperial order, it is our job to ask if he makes works of art. And then defend our answer. 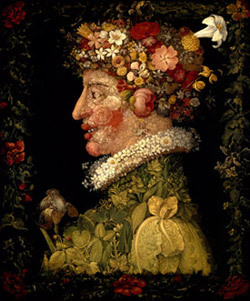 In other words, the Emperor has a pear where his nose should be, and apples for cheeks, but in neither case is the visual meaning of the item—pear or apple—transferred into the matter that makes up the head; they are added on, and they combine with the other fruits, vegetables and flowers to construct the unit that says head of Rudolph II. Let’s try to get a handle on this. Compare Archimboldo’s The Librarian (1566) with de Chirico’s The Evil Genius of a King (1914-15). 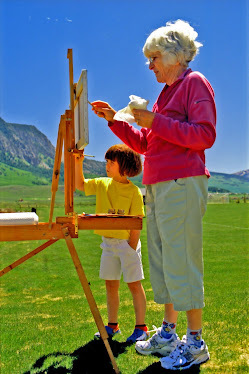 Use all your tools: examine the orchestration of light, line, color, and space. 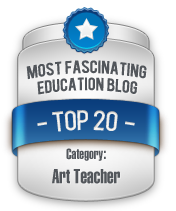 Describe the relationship of the illustrative, decorative, and expressive aspects. Define the picture idea in both. Think about similarities and differences. 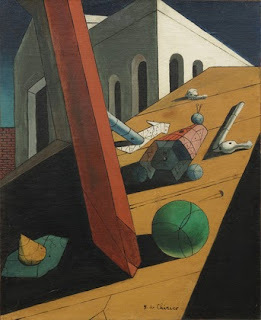 While both artists are indebted to the Florentine tradition, think about what de Chirico does to and with Florentine visual ideas like architectural massiveness and spatial variations that make them his and new. wow!! am i still in the class?? i saw the show and loved it. what a great way to "decorate" with veggies!! the dechirico has exaggerated perspective and the angle of the brown plank is higher and leads to nowhere. it creates a very dark dramatic shadow on the left and a black tiangle on thelower right. there is also a stark white triangle on the upper right. the red form is dramatic cutting the picture plane almost in half and also going nowhere , forming dramatic shadows with dark on the left middle part of the picture plane. your eye goes from the upside down L of light to the yellow little pyramid and then over to the light on the other side of the picture and around. 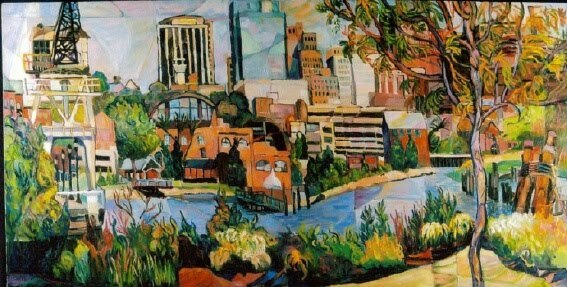 it is a dynamic composition with movement and drama. he has created an expressive image of drama and movement. the other one whose name now escapes me is a triangle, tradition composition whose light shines from the front with the background dark around the edges all around with little dram and little spatial variation.the red and white rectangular shapes are flat and regular and do not create different planes. the top of the triangle where there is a fanning out of white triangular shapes does make for some variation in the picture plane but that is the only highlight in a very traditional crunched together composition. he has created an illustrative decorative image which is a clever use of other materials to create something else, a trick of the eye. i am so busy getting ready to go on a trip and doing the last minute things i need to do, i cannot believe i just stopped everything and did this. but i did!!! i am afraid i will forget how to do it if i stop. thanks so much.